I want to expound upon the final point (the others are self explanatory). It is easier to “cherry pick” scriptures, finding those you can live with and discarding those that restrict you too much. It is easier to relax your own beliefs and talk yourself into accepting that the Bible is not God’s actual Word, but rather writings inspired by God (big difference), than it is to follow that narrow path. The alternative to denying the Word is, of course, knowing that the Bible is God’s Word and that carries a lot of responsibility. It means that you are held to a certain standard. Accepting the Bible as God’s Word and interpreting it literally draws you closer to God. You become one of His. To accept the Truth and follow the Word of God means a shedding of this world. It means a dying of the flesh. By nature, we humans are sinful. We can try to do our best to live the way Jesus taught, but it isn’t always easy and we will fail. That is why we cleanse ourselves in the blood – daily. That is why we repent and ask for forgiveness daily, because our human nature defies us. Whether it is thoughts, words spoken, acts or anything else, we still sin and do things that are not pleasing to God. The Apostle Paul said, “I die daily.” If it wasn’t easy for him, it certainly isn’t easy for us! So, with that in mind, it is easier for folks to simply surrender to the flesh, to live in the world because it is easier than walking with God. Living by God’s Word (the Bible) gives us the tools to kill the flesh and overcome the world. We find joy that can’t be found anywhere else. I have a peace that cannot be replicated by anyone or anything else. Living in the Word, truly living in the Word, helps us deflect bitterness, anger, frustration, depression, hatred and other non-productive emotions that eat away at us. While we may be faced with these emotions, we can use God’s Word to combat them and we can be released. Now, why would Jesus say that the Bible was the Word of God if it wasn’t so? How can Christians ignore this? Yes, it was written by different people throughout history; people who were working under God. God was working through them. There is history there in the accounts by different people, but the instruction from God is recorded in the Bible and is His infallible Word. I researched the etymology of “inspiration” in this scripture. The translation here is somewhat misleading for this era because the true meaning has been lost. I won’t get into it too much. If you are interested, email me and I will send you more info. However, I will tell you that the literal translation of the words from the Greek term is closer in meaning to “spiration,” not really “inspiration.” Spiration means to breathe out, meaning that the literal translation means the Word is God-breathed. Another way to understand it is that “inspire” comes from the basic Latin verb “inspirare” which means (literally) “to breathe into, upon or in.” So when the verse above says that all scripture is given by the inspiration of God, it means that it is the creative breath of God that brought the Word, the Bible, into existence. I worked for you today. I put in my hours, worked my hardest, did my best and still you don’t like me. Did you think I did not notice? I know that not all bosses are like you, just as you know that not all employees are like me. Some are better, some are worse. Maybe you hired me to fill a quota. Maybe I was already working here when you became the boss. Maybe you hired me to earn “brownie points” with your managers. Maybe you did not realize I had a disability. Do you regret it now? It seems that you do. You clearly don’t treat me like the others. You barely speak to me, yet you have lengthy conversations with my co-workers. I can hear you when you go into their offices. But, I have a job to do, right? I did not come here to socialize. So, I put my head down and I work. I work for you, making you look good. Do you realize that? Do you appreciate that? But I make accommodations to live in your world every single day. I am just asking you to make a few adjustments so I can be healthier, more productive, dare I even ask to be happier? Does it “cramp your style” to have to work with a cripple, retard, or whatever other colorful name insensitive people call me behind my back? Does my wheelchair get in your way? Does it irritate you because my hearing problem causes me to talk too loud? Does my speech impediment get on your nerves because you won’t slow down and take to try to understand what I am trying to say? Are my social skills not good enough for you so instead of trying to help me you ignore me? Why do you resent having me on your team? I have VALUE. I make valuable contributions both professionally and personally. It you would just take the time to get to know me (and yes, you may have to work a little, some of us have many layers of scar tissue from years of abuse insulating us against the world), you would see that I am good and useful. You might have to look past the wheelchair, the unusual behavior, the challenges speech, the differences between us to see the value. But it is there, I assure you. I am not like you. I did not choose to be this way, but I am. Why do you try so hard to make me feel disabled? Why can’t you treat me like everyone else? Why can’t you see the value of a human being who just wants to make a place in this world? The potential for prejudice, for discrimination, exists in every single group. In some group, somewhere, YOU are the different one, the “odd man out.” Never allow your pride and arrogance to take you to the place where you believe that you can’t be touched by it. Everyone can, everyone is susceptible. It is an inescapable reality. You may not like me because I am different – or maybe you don’t believe I have a disability at all (those of us with “invisible disabilities” such as Autism, Asperger’s, anxiety and depression know this well) – but just because you don’t believe it does not make it any less real. Live in my world for a day and you will see just how vastly different it is from your own. I accept you just as you are and I make adjustments to live in your world. What makes you so superior that I have to make all of the adjustments? Isn’t this my world too? Aren’t we supposed to all help each other, encourage each other, work together? When you start placing value on people based on their usefulness and value based on your own perceptions of what is useful and valuable in this world, be careful. One day, you could be sitting across from someone who is evaluating yourusefulness and value based on their perceptions of what is useful and valuable in this world. And it may not turn out so great for you. I will pray for you; pray that that never happens to you. No one deserves to feel like this, not even you. Yes, fear will hinder your walk with God. If you are afraid of being shunned or facing repercussions for what you believe, whether it is in your social group (“friends”), your job or your family, if you are afraid that they will mock you or turn away from you then you are allowing fear to impede your relationship with God. Some people may say that staying true to the Word causes hate and prejudice, but that is a lie! The Bible teaches us to love each other, everyone, but to abhor the behaviors that are ungodly. It isn’t prejudice, it is refusing to accept behaviors that the Bible teaches us are wrong. Stand by what you know to be right, even if everyone else is standing on the opposite side because if you are standing on the side of God, you can’t go wrong. Don’t let fear rule you. The devil uses fear to keep your feet stuck in the mud so you can’t go forward, you can’t reach others and you can’t grow. He uses it to make you hide your light so others can’t be exposed to the Truth through you. It takes courage to stand against the ever growing crowd that is pressing us to accept the ways of the world, pressing us to accept what is evil and call it good. And fear is a very effective tool. People fear losing their friends, their families, support systems, jobs. They fear being shunned, publically humiliated, “called out” on what is twisted into hate (when in fact it is just a refusal to accept what is ungodly or evil). But fear is also death. If you are living in fear, you will never go forward. If you are living in fear, you will slip further and further into the ways of the world. If you are living in fear, you will move farther away from God. If you are living in fear, you will never be able to shine your light upon the world. If you are living in fear, you will not be able to show others the Truth and lead them to God. You will deny them the knowledge of everlasting life because you were to afraid to step out and be set apart. Stand strong in your faith today. Step out and let yourself be set apart. 1 John 2:15 (NASB) ~ 15 Do not love the world nor the things in the world. If anyone loves the world, the love of the Father is not in him. Romans 12:2 (NASB) ~ 2 And do not be conformed to this world, but be transformed by the renewing of your mind, so that you may prove what the will of God is, that which is good and acceptable and perfect. I am GLAD to be different, to be set apart! I thank you GOD for setting me apart from this world! All I need, I have in Jesus Christ. And I am living in FAITH NOT FEAR! I am under attack. Satan has launched a pretty strong attack against me and his puppets are doing exactly as he directs. I think they may not have the spiritual strength that comes from God that would allow them to resist. They are praying against me, but the powers they are praying to are NOT God. I am not sure if they are aware of this. I am afraid for them. They have said and done horrible things to me, true, but they are still people with value, still children of God, still my brothers and sisters in Christ. I am afraid for the eternity that they face if they do not break those strongholds and turn to God, repent and return to His path for them. This is a dire, serious situation and I am asking you to please, please, pray for my enemies. Please pray for strength, wisdom, protection and favor on my part. And pray that it will be revealed to them just what they are serving. And please pray that God be merciful to them. The deeper they get into this, the worse the outcome will be for them on a spiritual level. This is a demonic attack and they are the catalysts. I don’t think that they even realize what they are doing. Please, take a moment and pray for my enemies, pray that those bonds be broken and their eyes opened. They will not stop me from doing what needs to be done here and satan is trying to stop me on several levels. I am not asking for a lighter load, just a stronger back. Please keep me in prayer because the battle is heated and the outcome for them will be disastrous if they do not return to God. Funny little cartoon, but so very, very true! God has been working on me (always!) in quite a few areas, but lately He has been pressing me to read my Bible more. He speaks to my spirit and confirmations in my everyday life. Just today, I ran across the cartoon I posted above. 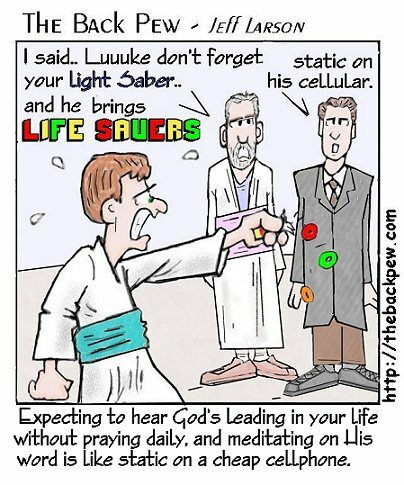 At about the same time I was looking at the cartoon, a friend started talking to me about some troubles she was having and I found myself telling her that the best thing she could do that would help immediately was to read the Bible. I did not even know where that came from (ever have those moment where it is obvious that God is doing the talking, but He isn’t just talking to the other person – He is talking to you too?). This led me to look and see just what the Bible says about reading God’s Word. We must feed on the word. Living in the Word will make you prosperous and successful (you will receive God’s blessings). If you love Jesus, you will read and live by His word. 23 Jesus replied, “All who love me will do what I say. My Father will love them, and we will come and make our home with each of them. 24 Anyone who doesn’t love me will not obey me. And remember, my words are not my own. What I am telling you is from the Father who sent me. God’s word tells us what is right and guides us in living our lives and fulfilling God’s purpose for us. 16 All Scripture is inspired by God and is useful to teach us what is true and to make us realize what is wrong in our lives. It corrects us when we are wrong and teaches us to do what is right. 17 God uses it to prepare and equip his people to do every good work. The spirit is what gives us life and God’s word nourishes the spirit, theyare spirit! 63 The Spirit alone gives eternal life. Human effort accomplishes nothing. And the very words I have spoken to you are spirit and life. 12 For the word of God is alive and powerful. It is sharper than the sharpest two-edged sword, cutting between soul and spirit, between joint and marrow. It exposes our innermost thoughts and desires. God’s Word is alive! The more you expose yourself to it, the more it will expose itself to you. You can’t escape the Truth, can’t hide from it, can’t pretend it out of existence. It is real, it is alive and it will set you FREE! So, what I plan to do is post scripture, a verse or two, (I will try my hardest) every day (I might skip a day here and there). I will reflect on it, read it in context and discuss it. But I would like for you to discuss it too. I would like to know your thoughts, how it impacts your life. It will be a virtual Bible study. How has God’s Word helped you? Do you find value in reading the Bible daily? Why? Do you want to do this virtual Bible study with me? too steeped in this world to see it. He reached out to me anyway. His rules would take my fun away. Rock bottom rose to meet me. But sweet Jesus never left me. with recollections of my past. I knew I had no right to ask. I’d lost, but oh how I’d gained! A dim memory from my past. I was cleansed and pure, Heaven bound! Full of joy; content at last. A Wow God DAY Today! I had the most amazing day at church! God spoke to me throughout the service. It was incredible. I had to take some time this afternoon to process it all. It was one of those “Wow, God” moments. I will give you background first. See, God has been dealing with me on some things, things that will take me way out of my comfort zone. He is pressing me to speak to groups, churches. I did public speaking in college, but then I had a topic given to me and an outline that someone, usually a professor, looked over and approved prior to my taking the stage. That makes me nervous, but He wants me talking to people, to groups, so I am ready. I know that He will facilitate it and that He will put the words in my mouth – especially after today. I have spoken to one church a couple of months ago. It went very well. While I have talked to my husband and a couple of other people about that concern, there is one thing I haven’t even had the nerve to take to God in prayer. I have been afraid that the group I have been called to minister to is too small. We are really a minority with just 1 person in about 150. I have wondered if my doing this would even make a difference. Finally, I have doubted myself. Is this making a difference? You know, the usual self doubt that creeps in to wreck God’s work. Plus, my life has not always been so great. I have not always been a very good person. I have done some things that are bad. I know that God has forgiven me, but still, sometimes those things from that past life creep in to haunt me and they make me feel like I have no business trying to lead others to God. Today, though, as I sat in church, my answers came pouring out, loud and clear. See, I have the Truth in me and it is my responsibility to share it. God has called each of us to be a light to the world. This is my light and I have to let it shine. Then, during the service, the pastor was talking. At first, he was talking about defending your ground, the things dear to you like ministries or people you are praying for. He was saying that the devil will try to knock you down and make you afraid, make you doubt whether you can do it, but it is worth defending. Then, all of a sudden, he started talking about the woman at the well. She was not a “good person” by the society’s standards, yet Jesus asked her for water. As the pastor pointed out, He could have created His own quite easily, could have gotten His own water. But, He wanted to use her. He has a purpose for her, so He asked her to do something that He could have easily done himself. She was His vessel. The point was, the pastor said, was that all we have to do is allow God to do His work in us, give ourselves to Him, be His vessel, and He will use us. What’s more, He will facilitate it all, giving us the wisdom, the words, the means to do what He wants us to do. Then the pastor said, “That wasn’t in my notes.” He never even knew that he was talking to me, that right then, at that moment, he was God’s vessel to reach out to me and let me know that this ministry is valuable and that He will facilitate it, will give me the words and the wisdom so that when the time comes and I do stand before people to talk about this, it will flow and reach the ears of those who need to hear it the most. God sure is amazing, isn’t He? Sometimes we ask the wrong questions. And when you ask the wrong questions rarely will you get a clear answer. Take for instance you have a bad job situation. Let’s say your boss is wicked or inept or is just a bad boss. Let’s say this boss is being cruel to you or instructing you to do things that you know are incorrect (not morally, but not the correct to do something). Do you rail against the cruelty? Do you “stand up” to them and “tell it like it is” to end the mistreatment? And just how does that work out for you? My guess would be that it doesn’t work out so well. Maybe the mistreatment stops for a while, but the turmoil is still there. The animosity is still brewing, boiling just under the surface. If you are “instructing” your boss, it is likely that they don’t take too kindly to it, especially if they have a big ego. To them, you are just a peon and they are the almighty, all powerful BOSS. And the turmoil is still there, the animosity still brewing. But what if God placed you in that situation to teach you something? What if He has bigger plans for you and wants to mold you, groom you for what is to come? I have had a similar situation recently, mistreatment by someone in authority. This person has such hatred and animosity towards me, it is almost palpable. When they come around, the entire atmosphere changes and you can feel the spiritual influence – not in a good way. This person is definitely NOT representing God! But, this person is only human, flesh and bone. They are of this world. So am I. The way we react to authority in this world is in direct correlation to how we submit to the authority of God. Think about it. If God does something that we don’t agree with, we tend to rail against Him, do it our way. Because our way is so much better, right? But that isn’t how it works. We learn these lessons in this world so that we are better equipped for what is to come. So I had to learn to submit to this person who is mistreating me. I had to learn to find the joy in Jesus’ love and favor while putting myself in a situation that is demeaning, hurtful and cruel. I have learned to look to Him. I have learned humility. I have learned that I can’t fix everyone and I certainly can’t save everyone. All I can do is set the best example possible. Someone is always watching. I had to submit to this person’s authority even though I did not agree with the way they treat me. There are probably others, but you get the idea. Other than that, stick it out and learn how to humble yourself. Submit to the authority and learn from the situation. This is a necessary lesson for what is to come. It is not your time – yet. I like perfection. I understand that many Aspies are this way. I like to do things perfectly, I HATE to make mistakes or have someone criticize my work (because that means it was not perfect). Even with people, one slip can ruin or the relationship. 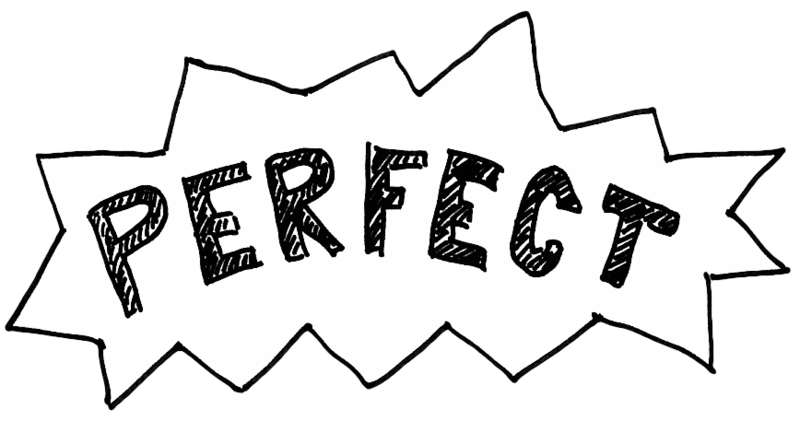 Once the “perfection” is broken, I have a very difficult time trusting that the person won’t do whatever they did again. I also have a difficult time seeing the relationship as whole again. To me, it is marred. This can go on for years. In my mind, I know that there is no such thing as perfection in the human world. Only God is perfect. I know that people are human and they make mistakes. I know that one mistake does not mean that a relationship is marred. But it does not make any difference. My brain gets into that loop and I hold to my ideas, my feelings that it is all ruined. I don’t know how to change that. It has caused some problems in my life. God blessed me with a wonderful husband, though. He is patient and, while there is no way he can truly understand, he tries to understand. At the very least, he accepts. He gets frustrated with me. I see it, though he tries to keep it contained. I need perfection; I need to be perfect. My rational mind, though, knows that that is an aspiration I will never achieve until I am gone from this world, this body. I have abandoned projects because I went outside the lines while I was coloring or cut something just a little crooked (yes, this started very, very early – as long as I can remember). I remember being a very young child and having meltdowns because I “messed up” a picture I was drawing or a craft I was making. It would torment me for days afterward. In school, I couldn’t handle making bad grades so I stopped caring, stopped trying. I only did just what I absolutely had to do because they made me. I still made good grades, but by “checking out” I removed myself from the “game” so I didn’t run the risk of failing. I didn’t have to face yet another aspect of myself that was not perfect. I think that we tend to do that in our walk with Christ, Aspie or not. I think that we look at the person on the pew next to us and think that we have to meet their standard, be as good as they are because they represent some level of perfection in Christianity. Sometimes, I think that NTs and Aspies are more alike than we may realize. Christians may feel “defective” because they don’t feel joy by just being one of God’s children, or because they have thoughts that they shouldn’t or they don’t feel God when they pray. What they don’t realize is that a relationship with God takes work – just like your marriage, your relationship with your kids, your friendships, every relationship you have requires work, why would your relationship with God be any different? You find joy by spending time with God on a regular basis. You pray, praise, worship, feed your spirit Godly, good and pure things. A by-product of that is you will have power over the bad thoughts and tendencies. They won’t necessarily go away, but you can control them. And if you want to feel God, just ask. I will write on this later. If you are interested, I would love to hear from you. It would be from an Aspie point of view, you know. Joy comes from these things. When you seek God earnestly, He will bless you. He will help you escape the perfect trap.